Posted in Product Reviews on February 2, 2016. Last modified on February 01, 2018. Read disclaimer. Over the past 5 or 6 years, no kitchen appliance has been put to the test more than our Oyama Rice Cooker, shown in this picture. It cooks all of our grains, dry noodles, frozen ravioli, sweet potatoes, turnips, and much more. But, actually, this well-worn Oyama cooker hasn't even been in the house -- much less our kitchen -- for the past several years. That's because we nearly always cook outdoors on our patio deck... so as to not heat up the house in summer or steam it up in winter. Yet, whether the temperature outside is 17° or 70°, the Oyama rice cooker cooks everything to perfection. And it cooks foods fast! It seems like once you snap down the lid, the cooker works almost like a pressure cooker. Unlike stove-top cooking, when the Oyama cooker somehow detects that the foods are done, it automatically switches to "holding mode" so the cooking process stops -- but things stay warm. Just a few days ago, I cubed up several very large, purple sweet potatoes, dropped them in the liner with a half cup of water and a pinch of salt, flipped on the rice cooker's heat switch and then proceeded to accidentally forget about it until an hour or so later. I was certain that the potatoes would be mush but - surprisingly - they still had their rich, deep color, were perfectly cooked and tasted wonderful. As for durability, I've often forgotten to throw a cover over the cooker when I'm done cooking so it has been rained on and snowed on several times, yet it keeps on working. At one point, we somehow misplaced the stainless steel steamer/strainer pan that goes inside the liner and the Oyama company was wonderful about sending us a replacement. Our only complaint is that 10-cup sized model emits quite a bit of steam if we have more than just a couple cups of water in the liner (that's why we very seldom use it indoors). For instance, if we put in 1 cup of brown rice (we always rinse our rice and soak it overnight in the cooking water to make the rice more easily digestible) with 2 cups of water, the rice comes out a little nutty. Using 1 cup of rice with 3 cups of water produces perfectly tender rice but emits an awful lot of steam. When I called the Oyama company about this concern, they mentioned that it is important to place the steamer pan in the liner, regardless of whether or not you're steaming anything. And, while I think that may reduce the amount of steam that comes out the steam-release hole on the lid, it does not solve the problem completely. Now, if we're adding only a small amount of water, such as when we're cooking potatoes, the steam is not nearly as noticeable. Very affordable and economical. Not only is the cooker affordable (around $65 on Amazon at the time of this review), but we hardly ever throw away food because it got burned or overcooked. Plus, because we do almost all of our cooking outside, the kitchen doesn't heat up in summer or get steamy in winter. Super fast, convenient and forgiving. As mentioned above, if you forget about the rice or vegetables, the Oyama cooker is very forgiving. I can't recall the device ever burning or overcooking anything. Excellent durability. We've used our cooker hundreds of times over the years, leaving it outdoors for most of that time, and it works as good as new. Excellent customer service. If found the Oyama company to be very helpful and responsive when we needed a replacement for our lost strainer pan and on the couple of occasions when I've had questions about the device. If you add more than just a few cups of water, the unit emits quite a lot of steam out the top "steam-release hole in the lid." (And there is a warning on the device not to block the steam hole.) The easiest way to address this issue, I suppose, is to set the cooker under your range top vent hood, if you have one. 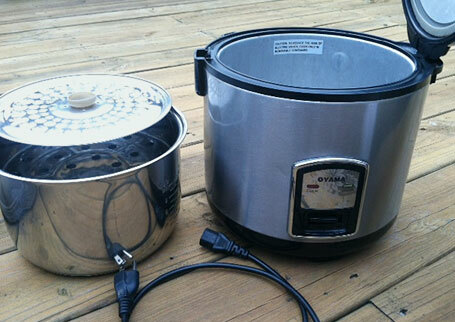 If you have feedback to share regarding the Oyama rice cookers, we'd love to hear from you. Please share your thoughts in the comment section below.